Blustery winds and lightning made the last few storms that passed through our area a little scary for my children. Sometimes, to help ease fears, we pull out books and read them snuggled close together during a storm. But, what would happen if those same storms made their way into a child's dreams? Janet Halfmann channels a child's creativity and spins an imaginative and informative tale about animal coats lost in a storm in her latest picture book, Fur and Feathers. "I can make new coats for all of you, just like your old ones," she exclaims. "Form a line and tell me what you need." A featherless duck? A bear without fur? In Fur and Feathers, a little girl named Sophia falls asleep during a storm while her mother reads a counting book about animals. The wind and animals enter her dreams, the animals get caught in a swirling storm and the wind blows their skin coverings right off. The duck loses all its feathers, the polar bear loses its fluffy white fur and the snake's scales fly away. Sophia must come to their rescue. At first she tries to dress them in her own clothing, but the animals agree that it isn't a practical solution (a diving suit looks pretty silly on a portly pig and the porcupine closely resembles Paddington from the classic books). Luckily for the animals, Sophia comes up with a better idea. She grabs her grandmother's sewing basket and, one by one, she proceeds to craft a new coat for each animal, adding her own special touches as she finishes each coat. The author leaves the end of the book to the reader's own imagination - was it truly a dream? Sophia, the main character, uses all her creative energies coming up with appropriate coats for the animals. She sticks pins and needles on the porcupine, uses a little green slime for the frog, and covers a fish in sequins. Illustrator Laurie Allen Klein certainly must have enjoyed creating all the animal artwork in this fun book. One page spread shows 26 animals without coverings standing in line, starkly contrasting a colorful ladybug with brilliant and starry new wing covers. (There's a nice little puzzle on that page, by the way. Bet you can't figure out the names of all the animals pictured from from A to Z...we surely can't!) We laughed at the silly clothing on the animals, enjoyed the illustrator's hints about what animal would get a new coat next, and loved the proud and adorable expressions on the animals' faces as they regain their new, improved coverings. 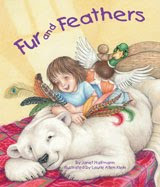 Fur and Feathers releases today (August 10, 2010) and certainly sparks the imagination. My kids thought about all the household items they could use on different animals if they needed a new coat and we had fun discussing the differences between the animal coverings. In fact, like other Sylvan Dell books, this fictional story contains an impressive educational component. The "For Creative Minds” section in the back of the book covers basic scientific classification. Young children (preschoolers through early elementary) can learn how to categorize animals in classes by observing their different skin coverings (Mammals, Fish, Reptiles, Birds, Insects, Gastropods, Amphibians). Teachers, parents, and homeschoolers can find free online educational resources to accompany this book on the publisher's website. Grouping Stuffed Animals - After reading the book, we gathered up all our stuffed animals and grouped them into their appropriate classes. The mammal group (71 total stuffed animals) by far surpassed all the other groups. Birds (7 total) came in a distant second. Even though we used the chart in the back of the book, one animal, the octopus, had us stumped as to what group it belonged. And, we ended up forming an entirely new category - Monsters! Animal Covering Craft - My daughter decided to try her hand at providing a bunny with a coat of fur. She searched our home and decided that the dryer lint would work well for covering a rabbit. 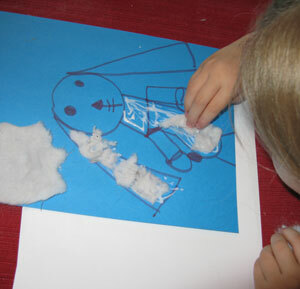 She drew a picture of a rabbit and glued the lint to cover her picture. Together we researched how to classify a rabbit and included this information on her craft page. (She modeled her drawing after her favorite stuffed animal, a stuffed rabbit that goes by the name of Summerfield.) This project would be so much fun to do with a classroom. 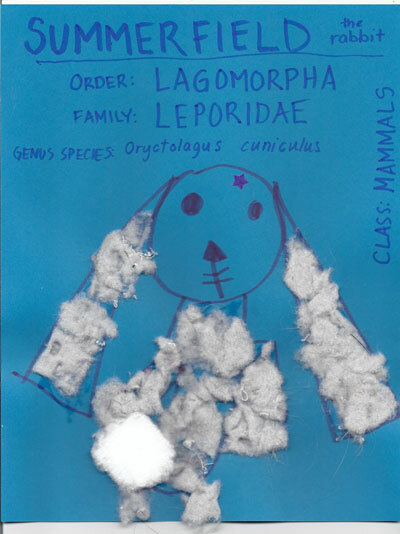 The students could combine their projects to make a touch and feel animal classification book. • Contest ends on Monday, August 30th, 2010 at 11:59 PM CST. Brimful Curiosities, thanks so much for the fabulous review and for hosting the giveaway. I just love the dryer lint bunny and the stuffed animal story stretcher! Butterfly wishes and wonderland dreams, thanks so much for stopping by and for your nice comment about Sylvan Dell books. Happy Reading! Morning Brimful, Just wanted to stop by and say hello and thank you for hosting Fur & Feathers and for your lovely review. Alpaca, Beaver, Cobra, Dugong (relative of the manatee), Echidna (spiny anteater from Australia & Tasmania), Flounder, Goose, Hyena, Indus River Dolphin (Chine), Jackal, Kiwi, Lemur, Manta Ray, Narwal, Owl, Platypus, Quokka (Australian marsupial), Rabbit, Salamander, Tapir, Uakari (S. American monkey), Vulture, Wombat, Xoloitzcuintli (Mexican Hairless dog), Yellowlegs, Zorilla (African skunk)! Butterfly Wishes & Dreams, i second Janet - thank you so much for your kind thoughts. The Teacher's guide looks very helpful and would be great as a mini unit study for homeschool families. Thanks. gahome2mom, thanks so much for stopping by. I'm glad you like the Teaching Guide. Sylvan Dell does an amazing job of creating those for each of its books. The publishers homeschooled their children, too, so they know a lot about what educators and families need. Have fun with Fur and Feathers! MaryAnne, so glad you find the educational content so valuable. And thanks, too, for your nice comment about the story. It was a story that was lots of fun to write. GabbyLowe, thanks so much for stopping by. Happy Reading to you and your kids! Please pick me to win this book for my children who are gaining a love of reading!! Anonymous, it is great to see you here. Enjoy reading with your children! It is such a great bonding experience! Sounds like such a great book...thanks for reviewing and coming up with great activities to go along with it. My favorite animal is a rabbit and I think cotton balls (pulled apart) would make a perfect new cover. Thanks for offering the giveaway. AStarrA and Bridget R. Wilson, thanks so much for stopping by. I love both ideas—a panda with fleece and a rabbit with pulled-apart cotton balls. I can foresee lots of fun activities with all kinds of materials creating new animal coats in the future—among kids and adults alike! this looks like such a cute pic, and the artwork is fantastic! My favorite animal is the Panda Bear. Since I have never touched a real one, I can only go on the stuffed version. I would probably use cotton balls that are torn apart. I follow you and subscribe by email and RSS reader. Looks like a sweet book my daughter would enjoy! Dawn, thanks so much for hosting me earlier on the tour. I just love the dryer-lint bunny, too! Elizabeth, thanks for your wonderful comments and for tweeting, too! Christine, I think cotton balls would work great for the panda bear! Thanks for visiting and tweeting. Mozi Esme, Happy Reading with your daughter! Have two Grandsons...3 and 5 who live with me. They would adore this book! Maureen, have fun reading with your grandsons. Thanks for stopping by. This would make a great gift for my DIL's niece. I love to give her books. What an adorable, educational, and thought provoking story. I'm sure that my 2 grandchildren would love this book AND they would be much more creative than I at coming up with new animal coverings! Thank you for the chance at winning a copy of this fantastic children's book! I would love to add this book to my classroom library. Wow! What an awesome Teacher's Activity Guide! It is very thorough and has a wide variety of activities. Pair those with the other two awesome projects and you have a whole unit of study. Love it! This sounds like such a fun, creative book! My son's favorite animal is the porcupine and he says he could give it new quills with toothpicks! For animals not very wooly we would use some old t shirts. Like an elephant could be gray knit or a horse could be a brown or black. For furry animals try using an old discarded wooly sweater! I subscribe by email and follow. This is a fabulous book, educational, fun and creative! Wow! I returned from a week's vacation with family to find lots more visitors. Thanks so much to everyone for stopping by and for your wonderful comments. Your ideas for new animal coats are so fun: toothpicks for a porcupine, shredded paper for a cat, knit t-shirts and wooly sweaters—the ideas just keep coming. I'm so happy that so many of you are finding the Teaching Activities on Sylvan Dell Publishing's website so helpful. Happy Reading to All! This looks like a fun book that would spark creativity in my kids and be a good story to read before doing some animal art projects. can only think of three birds in our large 'cuddly' collection! My oldest son has red hair, and for a project on lions last week, he had me give him a haircut so he could use the clippings for fur! I love Janet Halfmann's work and Sylvan Dell in general!!! I can't wait to see this one and share another great book with my kids! This book shows in an ingenious way how to learn about animals, but also going to sleep and dreaming can be a world all it’s own. Especially for children that won’t go to sleep because they are afraid they will have bad dreams. Wow, lots more comments. Thanks so much to everyone for stopping by and for your wonderful comments. I couldn't help chuckling about the young boy who will be using his red hair for lion fur! All of you readers are so creative! What a creative book! I bet my boys would love it!